Should a Pheasant Be Cooked With or Without the Skin? Does Simmering Ground Beef Make It More Tender? 1 Should a Pheasant Be Cooked With or Without the Skin? 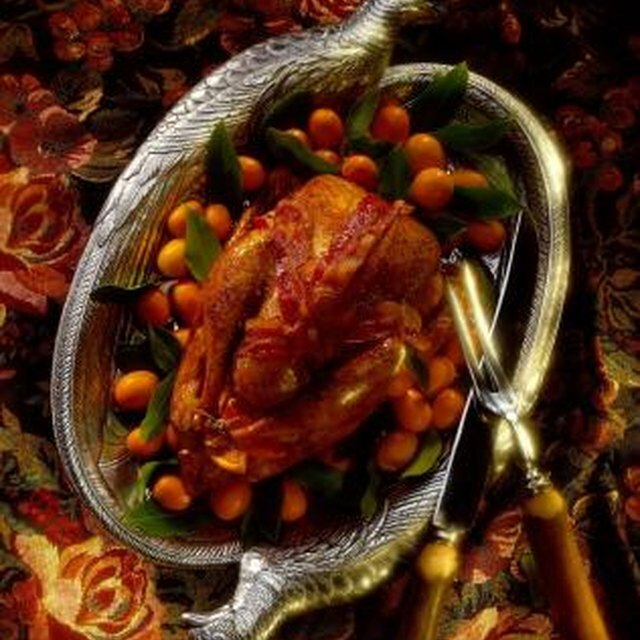 Roasted turkey is the centerpiece of the Thanksgiving meal and is served frequently on other holidays or at family gatherings. A moist, juicy, tender turkey makes the chef proud. Unfortunately, a meal of dried turkey is often the reality. If you want to serve up a mouthwatering turkey, rather than embarrassingly dry poultry, there are a couple of tips to consider. The traditional way of roasting a whole turkey begins by placing the bird on a meat rack breast side up. "The Fannie Farmer Cookbook" recommends starting the turkey breast side down to produce juicier results. After rinsing the bird and patting it dry, the cook rubs butter all over the inside and outside of the bird. To prevent the skin from sticking to the rack, "The Fannie Farmer Cookbook" suggests covering the rack with cooking paper. If cooked entirely upside down, the visual appearance of the bird suffers. To allow the skin to reach a golden brown, turn the turkey over during the later part of the cooking and remove the paper. For those who are not concerned about the visual appeal of the turkey, it is possible to roast the turkey upside down for the entire time. When cooked in this manner, the juices do not run away from the breast, they run to the breast. If producing a juicy turkey is a priority, consider deep-frying the bird. When the turkey is dropped into the hot oil, the heat sears in the juices, resulting in excessively moist turkey, without being greasy. Do not attempt to deep-fry without the appropriate equipment, designed specifically for frying whole turkeys, as the process is extremely dangerous. Set up the fryer outside, away from buildings and overhangs, and never drop a frozen, wet or damp turkey into the hot oil. Do not overfill the fryer with oil. Follow the manufacturer's instructions when using the fryer. While many cooks rub down the outside of the bird with butter, other cooks have good luck using roasting bags to keep in juicy moistness. Only use roasting bags designed specifically for roasting turkey, and never use plastic storage bags, which will melt and contaminate the poultry with toxic substances. Overcooking the turkey will dry out the meat, regardless of your cooking method. Turkeys often come with pop-up indicators to let the cook know the bird is finished. For some cooking methods, this indicator is of little use, especially if it's cooked in a position that blocks the indicator. One trick to see if the bird is sufficiently cooked involves gently jiggling the turkey's leg. A leg firmly attached to the bird indicates the turkey needs more cooking time. When using a meat thermometer, insert it into the center of the meat without touching a bone.